I was browsing through New York mag to find the best of the best in restaurants and bars, when I stumbled upon The Marrow. It was voted best cake in NYC, and it wasn't even cake I was looking for but I knew I must go. 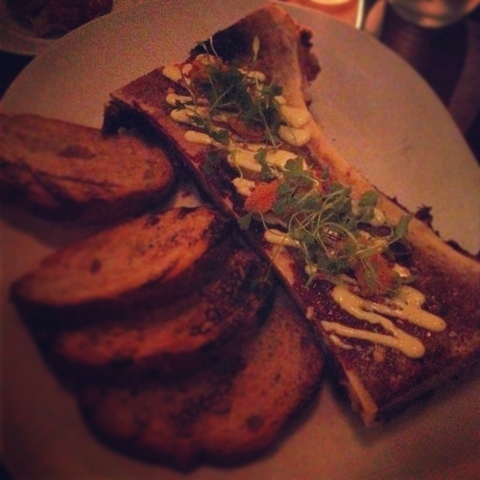 I heard of this place before, so I assumed I must have read that they serve good bone marrow. Duh. 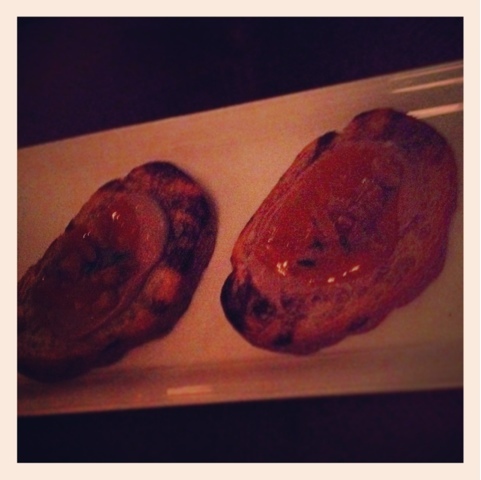 I did my research and sure enough, they have an increasingly popular dish: bone marrow with sea urchin! Gasp. I made a reservation almost immediately upon reading the menu filled with savory German/Italian comfort foods. Next thing you know, I'm on Bank Street in the West Village with a Marrow 75 in my hand. 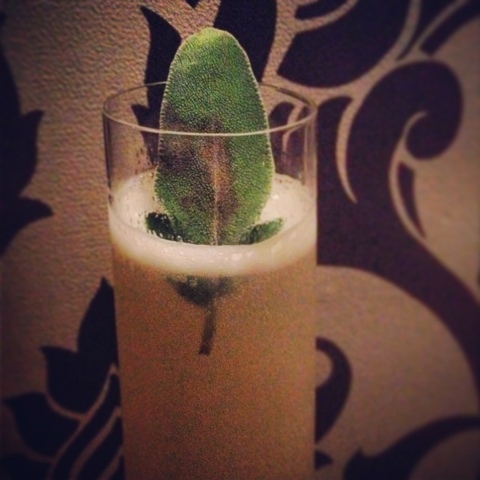 Oh, that's their signature cocktail: pink gin, lemon, sage, blanc de blancs. My new favorite cocktail, and I usually don't even like gin! I guess I love a pretty presentation with unique ingredients and the perfect balance of sweetness to alcohol. It was a whirlwind of small plates. 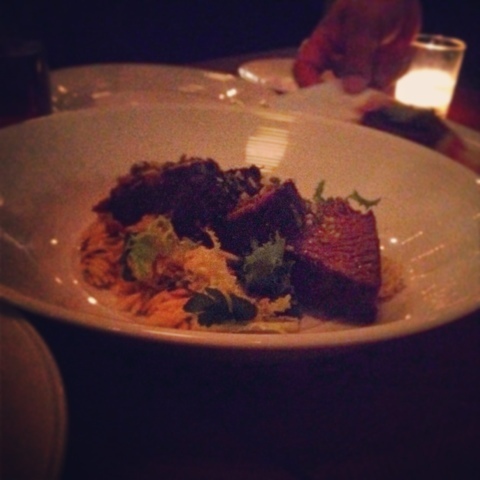 Some of the dishes were crispy braised duck, foie gras mousse, burrata, and short ribs. The duck was incredible. Our waiter sold us on the way it was cooked and pressed to obtain such a crispy edge. We tried the cotechino with lentils, but both the sausage and the lentils were too salty for my taste. Now lets get to it. The bone marrow!!!! This was (obviously) the highlight. For only $16 you get a nice size bone. I've paid more for less (cough, Landmarc, cough) and this was truly a breath of fresh air. There was actually more marrow than I expected so I could barely finish it all. At one end I pulled out a huge piece and I felt like I just struck gold! The sea urchin was full of that BRINY flavor. I always joke about that word because I have yet to hear a food review on sea urchin without "briny" being in it. Yes, it does taste like the ocean in the best way. It also has a nutty taste. And a mucus texture, says my friend. I think the texture is more firm than the mucus I have tried, but who am I to argue. Anyway, the bone marrow was topped with sea urchin and Meyer lemon aioli. I would've been happy with just the marrow and sea urchin. Better yet, I'd be happy with just a box of sea urchin for $8 from the Korean market. Now, now, now. You didn't think I would leave without trying the best cake in New York, did you? I really let myself go with this one. The Ginger Stout Cake. 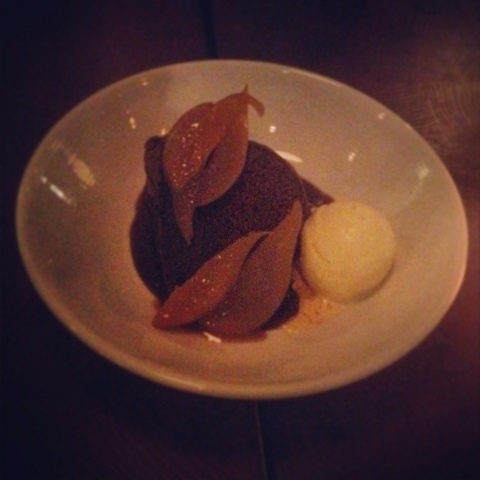 It looked like a slice of bundt cake with cinnamon and ginger spice to it, roasted pears and honey ice cream. I usually skip dessert because I'm too depressed by how much I've already eaten, but for the best cake in the city I made an exception. It really was fantastic, and instantly I felt my food coma being replaced by a sugar rush. My heart was beating a little too fast after my body took in all that sweetness, but it was welcomed. Do yourself a favor and go here! Do the Fat Jackie Pre-Fixe: Marrow 75 Cocktail, Bone Marrow, Ginger Stout Cake. The End. I went there and had the dessert, it was delicious! I had a sampling of dishes too and did not understand the combination of items on the dish with Burrata... crunchy pickled carrots?? 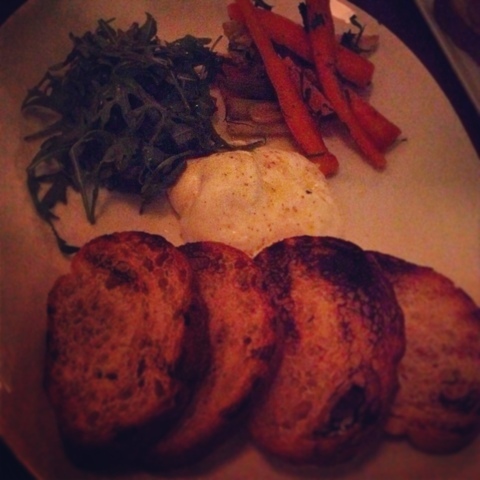 definintely not impressed with the burrata dish.